For the longest time I've wanted to put together a little coffee bar in the kitchen. I wanted a way to organize all my coffee needs in one place and to simplify and streamline the process of making coffee in the morning and of course, it had to look cute. In the spirit of shopping at home first and repurposing what I already own I started nosing around. I was using this set of storage jars in the cupboard filled with snack foods. I knew they would look great on the counter and the size was right for what I had in mind. Since the snacks are behind the closed cupboard door I found a small, empty plastic tote to replace the canister set with and it serves the purpose perfectly. I used my chalkboard paint and put a couple of coats on each jar and finished it off with a framing of white craft paint creating simple, changeable labels. I love the look and it cost me zero dollars. The best kind of organizational project in my book. I love this idea. 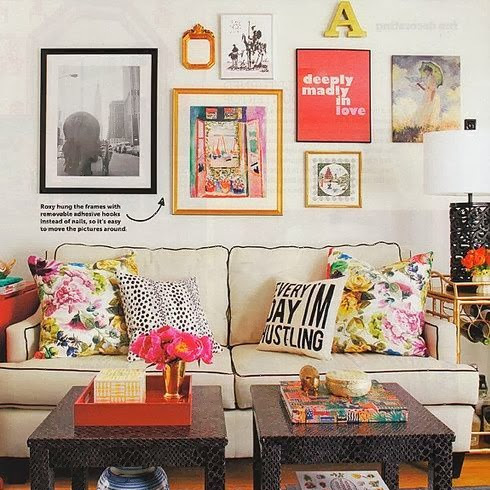 Organization is my love language. Simply adorable set up you have going there. 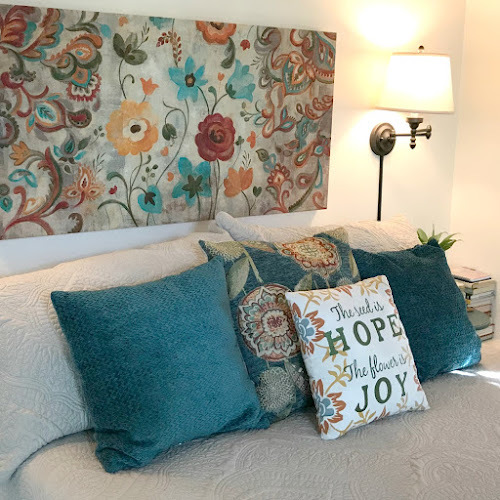 Love the use of the chalkboard paint, and the fact that it cost $0 was even better. Fabulous job!! 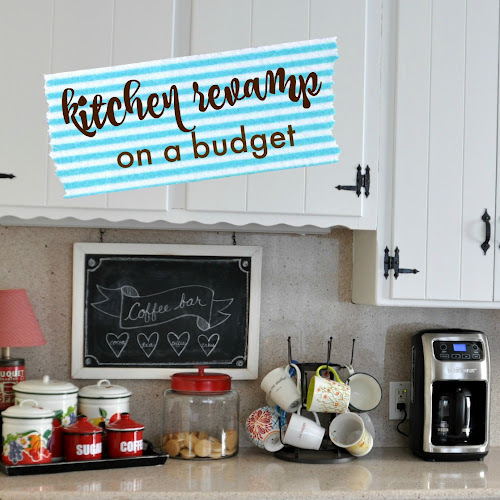 Yes!I love the whole idea and also your red kitchen accents! What a great idea! And what a great price! It is always nice to be able to use what you have in a new way! What a great idea. I love the chalkboard paint that you used for the labels. Thank you for stopping at my blog. Very nice. I have my coffee pot and coffee canister in a tray. Love my coffee!! Patti that is so cute and I love your labels. No spending is the best way to do it. 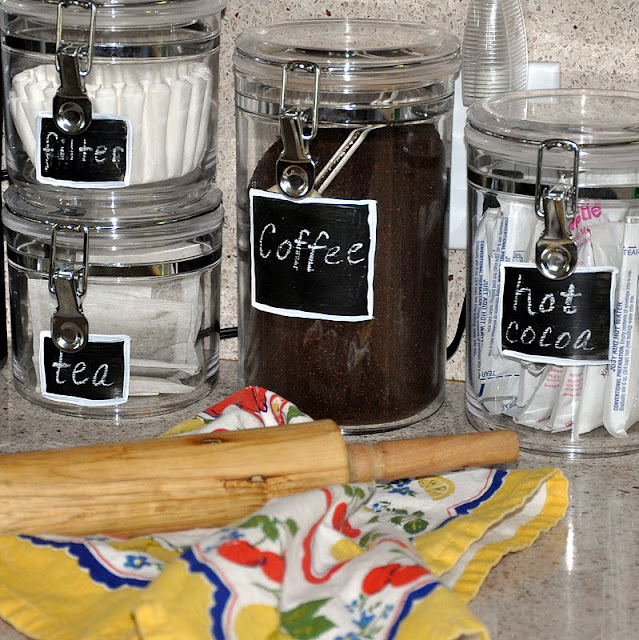 Such a cute idea for a coffee bar! 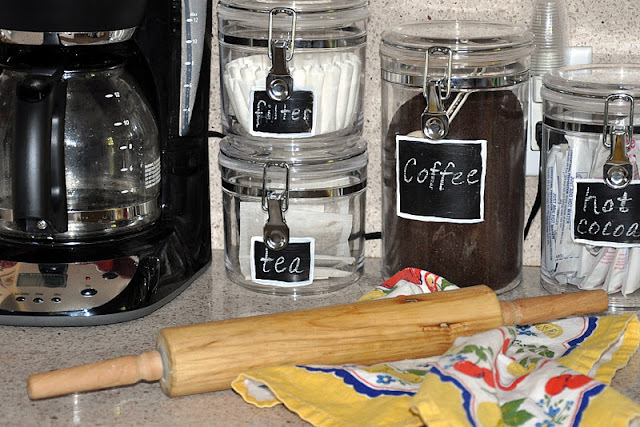 and I have never thought of using blackboard paint on jars to write labels on...that's such a good plan! Have a happy week, Patty. Makes me want to join you for a cup of coffee. What a creatively done project! I wish you an autumn and winter season, with lots of cups of coffee and hot chocolate with those you love. Very nice coffee display! Don't ya just chalkboard paint? This looks so nice and it is a great idea. 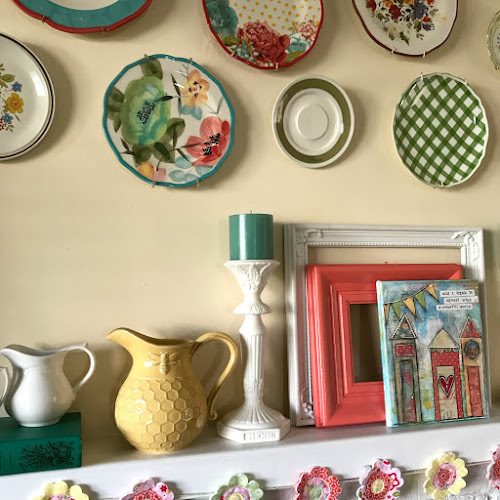 A great project, I have all my coffee mugs and makings in a little cupboard at the end of the kitchen with the coffee maker on the counter below. It really is handy to have everything you need in one spot. 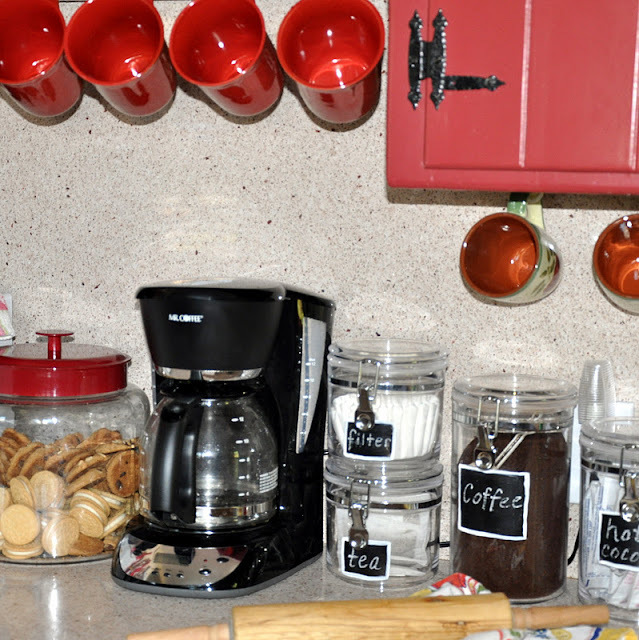 I really like those clear canisters witht he chalk paint too.It all looks so good when it matches! 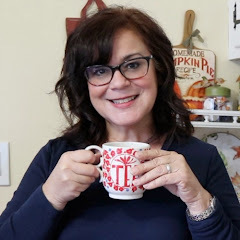 Thank you for leaving a comment on my blog! Great idea to create a coffee bar and label the jars. That is great...and of course I love the red! How fun! So cute!! I love when things work out like that!! Can I come over? I'll bring the cinnamon rolls. If that isn't just the cutest idea I have seen in a long time. Your are super clever to use what you had. I love that the cookie jar is right next to the coffee pot too. I may have to steal (borrow) this idea from you.